The Swallows name has long been associated with sports at Livingston Academy and continues on even today. During the years 1943-1956, Elmo Swallows had his hands full with the sports program at our local high school. He served as coach for not only the football team, but at least one year, he was coach for both girls’ and boys’ basketball teams as well. The fact that he had all these responsibilities did not keep him from being really successful in his coaching career. In 1949, his girls’ basketball team won 48 straight games and held the record for the entire State of Tennessee for many years. A Nashville newspaper article tells how Coach Swallows accomplished this record with a squad of just 15 players, and only three were seniors. "Playing basketball was the most important thing to those of us on the TEAM. Besides our immediate family, Coach Swallows and his boys were our extended family. Coach instilled in us that we could be ladies and always strive to do the "right and correct thing" in every facet of our life and yet do what needed to be done on the court. We were as aggressive as any ladies high school team could be, determined to win against any and all and, I suppose, received our identity at that time from the team. There were never any disagreements, hard feeling or anything of that nature between any of the players. We felt a bond that is still strong to this day. Those were literally the "good old days". Coach's kind and mild manner seemed to make us stronger than had he been loud and aggressive. Don't misunderstand that he could not speak in strong terms to emphasize that we WOULD WIN. His determination seemed to keep us fired up. I remember playing in gyms with pot-bellied stoves and having to watch to not fall into them and be burned. We only knew half-court play. To think that someday we could play full-court never entered our minds. Although I lived in town, I would regularly get on the school bus with Sue Windle from Monroe and spend the night with her and we would verbally play ball into the night discussing our strategy against our opponents. The trips on the school bus to the different places to play ball will always be a fond memory. Our singing went on and on. "I'LL FLY AWAY" was our #1 absolute favorite and we would sing it over and over. If my memory serves me correctly, I believe that we had won 50+ straight games and were now in the Mid-state Tournament in Murfreesboro. It was so exciting to stay in a hotel/motel. Then the bottom fell out of our world. We lost. I remember the devastation that I felt. Despair couldn't have been any greater had we been in the Final Four and lost. It took some time to get over the defeat and I still remember the sadness to this day. These are just a few of the wonderful memories I have of Livingston Academy. I have told so many people down through the years that we grew up in the best of times, in the best of towns where we all had about the same and, if we were deprived in any way, we did not know it. Even though I have been away for many years, I still consider it HOME." Next is June White Speck: "What I remember about our ball team during the years I played at L.A. was the camaraderie of the players and how well everyone got along. Swallows (as we called him) was a mild mannered coach, never getting angry with anyone, at least not showing it. He was the basketball coach for both boys and girls teams as well as football coach. There wasn’t a state tournament at that time, but was divided into regions. The record for the ‘50 and ‘51 season was 58 wins and one loss. The team won the Regional during the ‘49 season. During the ‘49 season, we had four sets of sisters and two sets of those were twins. Sisters were: Jackie and Johnnie West (twins); Faye and Sue Windle; Kathryn and Pauline Hinds; and June and Joan White (twins)." Inez Vaughn Thrasher: "When I was a freshman at Livingston Academy, Coach Elmo Swallows encouraged me to play basketball because two of my brothers, Raleigh and Derward Vaughn had played basketball for him and were members of his basketball team in 1946 when they played in the State Tournament. I did become a member my freshman year and went on to play four years for him. It was a pleasure to be on the ball team during the 1949-1950 season when Coach Swallows led our team which had only one loss that year and went on to win the Girls’ Mid-State Championship game. No state tournament had been incorporated for girls’ basketball until a later date. During some of our ball trips, Coach Swallows of course would be nervous about winning the games. He would encourage us to sing on the bus and we would sing mostly gospel songs. Willard Winningham was our bass singer and he could always bring a smile to Coach Swallows with his deep bass voice. I consider it an honor to have had the privilege of playing basketball under the direction of Coach Swallows. I will always remember him as a man who demonstrated respect for our team as well as our fellow man, and he taught us to do our best and believe in ourselves. He will always be a man who has a special place in my heart." Iris Dean Coffman Poindexter: "First of all, Mr. Elmo Swallows was a wonderful man. He helped many students get jobs after school. Our team played 58 games during the three seasons from 1950-1952. We lost one game to Sparta in the regular season by one point. The loss was like a death in the family. After the game, the locker room was like a funeral. We were all heart broken. There was a player on the Sparta team that could not stop. After the loss, Mr. Swallows made us practice to stop that girl. It was my job as a guard to defend her. In practice, Mr. Swallows would pretend to be that Sparta player. Her last name was Bumbalow. Practice after practice, he made me defend him in preparation for our next meeting. I got really tired of being pushed around by Mr. Swallows in practice. It was a real battle every day. When the re-match came with Sparta, I was ready, and guarding "Bumbalow" was easy compared to guarding Mr. Swallows. We won easily. Mr. Swallows was a great man and coach. We all had great respect for him." Anna Ruth Robbins Smith: Nell Bilbrey Roberts and I decided one day that we would cut class after lunch. We left the school grounds, headed toward the square. We hadn’t got very far when a car came up beside us, and wouldn’t you know it, the driver was Coach Swallows. After stopping the car, he said just two words ... "Get in." We did what he said of course, not knowing what was going to happen next. Surprisingly, he drove on toward the square, and when he got to the corner near Morgan’s store, he stopped the car and asked if this was where we were going. We said, yes, it was, still not knowing what might possibly happen next, but to our amazement, the next thing he did was to turn around and look at us and said ... "I won’t tell if you won’t!" Anna Ruth also remembered how kind Coach Swallows was to members of the ball teams who many times would not have money to buy a hamburger and coke after traveling back to Livingston from an away ball game. When everyone else went in to eat, those who didn’t have money stayed on the bus. Anna said on many occasions she was in the number who did not have any money, but Coach Swallows would often come back to the bus and tell everyone to come on, he was buying. 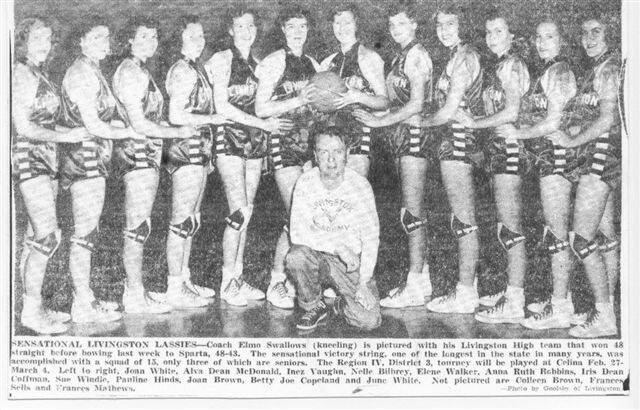 Elene Walker Cantrell: "Some of the best and most memorable days of my life was during the time that I was a member of the Livingston Academy girls’ basketball squad, 1947-1950, and to have had a great coach, Mr. Elmo Swallows. We were a loud bunch, especially when we were on the bus coming home after a game, as Winners. We had two songs in particular that were favorites of ours. A gospel song, "I’ll Fly Away," and a popular song, "Mule Train." The latter song made the top charts, I believe, by Mr. Frankie Laine. We sang these songs to the top of our voices. Our Coach never, ever put anyone out! Thank you, Mr. Swallows. Our good coach had sort of a nervous tic at time, especially if the opposing teams were ahead. He would cross and uncross his legs, pick at the top of his socks, and make a funny little sound in his throat. Some of us girls decided to mimic him, but I don’t believe he was ever aware of this. But had he been aware, he would just have shaken his head, and grinned that side-ways smile." Betty Jo (Copeland) Speck: "I don’t want to brag too much on the 1950's girl’s basketball team, but what a team we had! Even though we had some talented players, Coach Swallows knew how to maximize the strengths of each one. I guess the one thing I remember about this great coach was the tremendous patience he demonstrated at all times. I don’t ever remember his yelling or getting upset with any of us, although I am sure he felt this way on many occasions. His character and leadership qualities taught us so much more than just the fundamentals of the game. I feel very lucky to have had him for a coach and friend." Coach Swallows retired from teaching in 1956, but the Swallows name was once more included in the teaching roster of Livingston Academy in 1969 when his older son, Pat, began his teaching career there. Presently, Pat is Guidance Counselor and long-time coach of Wildcat baseball. Now a third generation of the Swallows family is included on LA’s teaching staff. Grant Swallows, son of Pat and Louise, began teaching in 2003. In addition to his teaching responsibilities in Communications and in English, he is Livingston Academy’s football coach. To be remembered so fondly many years later says a lot for the influence and respect Coach Elmo Swallows had on those who played on the teams he coached. I know he was proud of Pat’s accomplishments in his coaching career with the baseball ball team, and I feel sure he would be extremely happy to know his grandson, Grant, is also involved in the sports program at Livingston Academy. But one thing is for sure. If he was still with us to stand behind the fence watching Pat’s baseball team when there were runners on the bases, one thing we would definitely hear him say ... "Ducks on the pond boys, ducks on the pond!"